Physicist Louis Lanzerotti receiving an award from the National Academy of Engineering for his impact on space science research and policy. 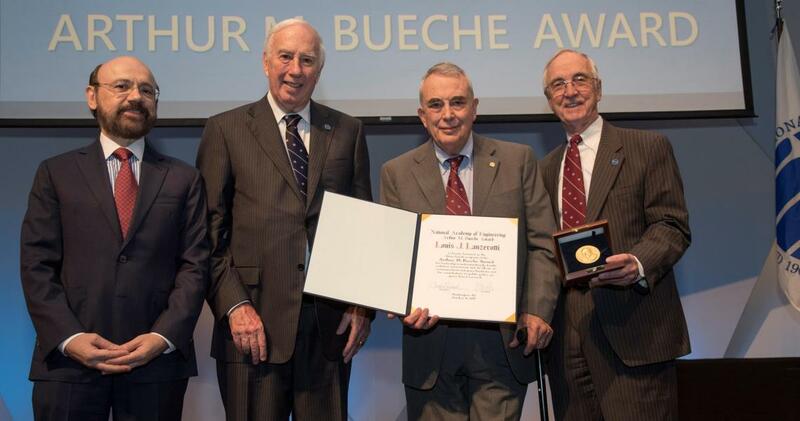 Named in memory of Bueche – the top technical officer for General Electric Co., an advocate for science and technology adept at applying research to benefit society, and an adviser to universities, presidents and international organizations – the annual award recognizes pivotal contributions not only in the arena of science and technology, but in public policy as well. In the mid-1960s, just as U.S. space exploration was taking off, Lanzerotti began tackling some of the fundamental challenges of flying spacecraft in orbit around Earth. With a newly minted Ph.D. in physics from Harvard University, he joined AT&T Bell Labs to study Earth's radiation belts just as the AT&T Telstar satellites were launched. “As issues arose around the effects of radiation on space hardware, Lanzerotti participated in the building, testing, and calibration of radiation instruments for first-generation geosynchronous telecommunications satellites. His work helped develop robust space-based communications and science systems, and contributed to many NASA space missions that have allowed us to expand our knowledge of the universe,” the academy noted in a release. The academy credits him with advancing the public’s understanding “of these invisible but potent forces” through papers, symposia and national and international panels, ultimately reaching a wide audience of fellow scientists, technologists, engineers and policymakers concerned about protecting space- and ground-based technologies – from spacecraft to energy and communication grids – “from potentially catastrophic disruptions caused by powerful blasts of radiation” from the Sun. But he did more than testify. Over the years, he has argued persuasively on behalf of space research before powerful policymakers, as in the mid-1970s, when he was asked to join the NASA Physical Sciences Committee, then an external advisory committee to the agency. At the time, he noted, there were “resource pressures” on NASA science and the opening of space research to a wider range of disciplines. Many committee members contended that studies of “particles and fields” in space around Earth should be finished and that research dollars would best be spent on other scientific topics. “As the principal committee person in this allegedly obsolete research field, I was asked to make a presentation on the subject. My talk was equally devoted to frontier areas of space plasma physics research and the practical implications of NASA’s research in the field, past and future,” he recalled, adding that a U.S. Senate staffer in the audience was “very taken with the practical applications of this research in NASA’s program” and asked him to speak at a NASA hearing on Capitol Hill. That appearance ultimately produced tangible results: the establishment of the currently-named NASA Heliophysics Division, which encompasses fundamental science and its applications. Decades later, he weighed in forcefully on the continuation of the Hubble Space Telescope via the installation of new instrumentation. After the NASA administrator initially decided against it, the National Academies quickly formed a Congressionally-requested committee to evaluate the scientific merits of maintaining the space-based telescope, as well as the risks of its human servicing – deemed necessary – and asked him to chair it. He delivered the committee’s findings to the NASA administrator and his staff “in a small NASA conference room on a quite cold, dark December, 2004 evening” and noticed that the administrator had stopped listening after the third page, which presented the committee’s recommendations for human servicing. Among Lanzerotti’s many awards in recent years are the American Geophysical Union William Bowie medal and the U.S. Antarctic Service Medal. Mount Lanzerotti in Antarctica was named in his honor. He served a six-year term on the National Science Board, from 2004 to 2010, and chaired its Committee on Science and Engineering Indicators much of that time.